This elevated toilet seat by Drive Medical fits most standard and elongated toilets. The lock ensures a tight fit providing additional safety and added feeling of security. A wide opening in the front and back allow for worry-free personal hygiene. The elevated seat and padded arms will help individuals who need a boost sitting down or standing up from the toilet. This raised toilet seat has 18 inches between the arms and increases the height of the toilet by 4.5 inches. Seat width is 17 inches and seat depth is 16.5 inches. Weight capacity is 300 lbs. 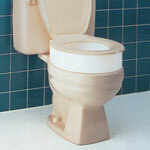 For persons using a wheelchair, tool free removable arms allow for easy transfer to and from the raised toilet seat. The product comes protected by a limited lifetime warranty.